Stauss Builders, LLC is a residential design, build and remodeling company established in 1994 to provide Fairfield County with cost effective building solutions to meet the needs of your family and everyday living. Meeting the clients every need and creating the home of your dreams is his top priority. When you hire Stauss Builders, LLC you get John Stauss a second generation craftsman on your job site ensuring quality, timeliness and efficiency. His relationship with skilled plumbers and electricians allows him to manage your job from start to finish. Stauss Builders LLC – master carpenters, lead safe certified and energy aware. Contact us today 203-319-0271 for a free consultation and estimate. We just wanted to let you know how excited we are to move into our new home. It is such a beautiful home, that you clearly put a great deal of care into building. Thank you for that! We look forward to spending many years raising our daughter in such a beautifully built home. Our project was very intricate from an engineering standpoint and John had the ability to communicate effectively with both the architect and structural engineer. John was able to solve engineering and logistical problems that arose during the course of building our home in a way that expedited the project and avoided extra costs. Most homes built before 1978 may contain lead-based paint. Projects that disturb lead-based paint can create dust and endanger you and your family. Lead can affect children’s brains and developing nervous systems, causing reduced IQ, learning disabilities and behavioral problems. 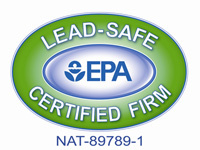 Lead is also harmful to adults and pets. The key to protecting yourself and your family during a renovation, repair or painting job is to use a contractor who performs lead-safe work practices. Why risk your health and the health of your family?